Following the Springboard Program I have moved agency and stepped back into an operational management position similar to the role I played prior to 2010. This was only achievable after I was provided the skills to re-evaluate the direction I was heading and accept that I was the only person that could change that. Thank you so much, you gave me back my career I was pining for when I attended the program. Just wanted to say a big thank you! Just wanted to say a big thank you for yesterday, the first day of the Springboard Program. I really enjoyed the content covered, and especially enjoyed the amount of enthusiasm, experience, encouragement, support, knowledge and energy you provided. Look forward to meeting up with you again on the next workshop day! Just wanted to say a big thank you for yesterday, the first day of the Springboard Program. I really enjoyed the content covered, and especially enjoyed the amount of enthusiasm, experience, encouragement, support, knowledge and energy you provided. Look forward to meeting up with you again on the next workshop day! The Springboard Program was amazing...I'm so glad I attended this program. It came at the right time in my life when I needed some inspiration, some self reflection, some motivation and some self awareness, and I achieved all of the above, in a fun and engaging environment. Our facilitator Melanie was full of energy, and kept the course interesting with her humour too. These types of courses help change lives and thanks for being a part of making women more confident, happy and assertive people! Thank you for helping me figure out the puzzle of my life. Things are now so much clearer. What a great person you are. Thank you so very much. I loved the course. The whole course was enlightening and uplifting and of great value to us all. We came away with a much deeper understanding of ourselves. Mel, thank you for being a role model and an inspiration to me. You are just awesome Mel! A true inspiration. Many, many thanks. Thank you for such a wonderful course. It has honestly made a difference to me. Things have started to happen but I can't officially say anything yet. (I will let you know). Thank you for assisting me to make changes in my life. You have the ability to make me feel comfortable enough to participate and voice my opinion. It has been a great four days. Has made me think about how I approach situations and to think about the future. This course has helped me clarify my directions and goals. Your presentations have been fun. You are a great person! Attendance at the program had an enormous effect on my life, it enabled me to find my way out of the rut I was in, reassess my career and move on. I didn’t realise at the time the benefits I obtained in regards to the rebuilding of my confidence and self-esteem and the difference these made on my life. Thank you for this course, it helped open my eyes on a new direction. A comprehensive women's development programme. Springboard was a turning point for me. It opened my eyes to my potential. What is particularly impressive is that everyone on the course has reported personal progress. They are more assertive, more confident and more committed. BP was the first company to use Springboard in Australia in 1992. Full of practical ideas and skills that work and, unlike other workshops, they stay with the women who have participated as the women have taken responsibility for their own changes and futures. 'Inspir-actical' is how I would describe Springboard. It inspires women to decide what they most want to achieve and then, very practically, helps them do it. It's fun and involving. I have a different view of her now. She will take a high level of responsibility rather than expect direction and instructions. I feel more confident about giving her responsibility. The Springboard Program has proved very beneficial to my staff. It has encouraged them to take responsibility for their own lives, to be more positive and to set both personal and work goals. Our company has a long history of using the Springboard program Few programs are available today which provide the same 'A-ha' liberating experience as that offered by Springboard. For this reason and more, Boral Limited will continue to offer this program as one of its key developmental activities. We strongly support the role of women in management positions and Springboard assists them to fulfil career objectives while maintaining a balance between work and personal life. 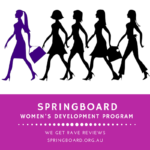 Springboard has been successful in encouraging the women to reassess their lives, both business and personal, and equipping them to make whatever changes they decide. It has also enhanced the communication between the employees and management. The noticeable improvement in positive attitude, how my staff see themselves and their job and their all round participation is definitely attributed to the Springboard Development Program.